Tim Cook expects a banner holiday for the Apple Watch, however. If you were hoping the smartwatch market would bounce back from its recent slump when a slew of new models hit the market, you're about to be disappointed. 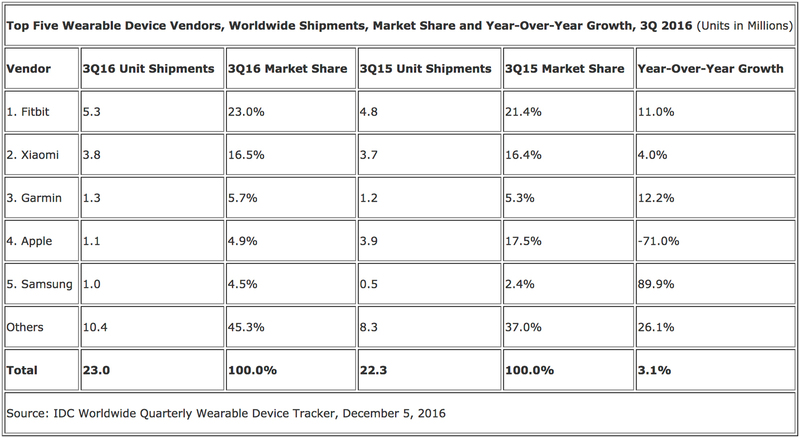 IDC estimates that wearable device shipments grew ever so slightly (3.1 percent) in the third quarter of 2016, but that fitness trackers were almost exclusively responsible for the increase. Fitbit, Garmin and other activity band makers improved their shipments by the double digits, while the smartwatch world actually shrank. Apple still leads the smartwatch sphere in these estimates, with 1.1 million Apple Watches shipped over the summer. However, that's a steep drop of roughly 70 percent year-over-year -- Apple was moving 3.9 million in the third quarter of 2015. Samsung was a rare star in this field with shipments doubling, although IDC cautions that the numbers are artificially inflated thanks to Galaxy Note 7 buyers who got to keep their free Gear Fit 2 and Gear IconX extras despite having to return the phone. A significant chunk of its shipments came from cellular-equipped Gear S2 watches sold through carriers. It's hard to say how much of a decline the smartwatch market is facing, assuming it faces one at all. Apple Watch Series 2 only started shipping two weeks before the quarter ended, and Samsung's Gear S3 didn't arrive until mid-November. A recovery was unlikely during the summer -- if it happens, it'll be thanks to holiday shoppers picking up new models. No matter what, it's clear that smartwatches aren't as red-hot as companies initially thought they would be. Update: Whatever happened in the summer, Apple is expecting a blockbuster fall. Tim Cook informs Reuters that the Apple Watch set an all-time high for sell-through (that is, units reaching customers and not just stores) in the first week of holiday shopping. The wristwear is likely to have its "best quarter ever," he adds. That's good news for Apple, but it's hard to put into context without numbers. How well does it compare to Fitbit or Samsung, for instance? The one certainty: if that forecast holds up, the Apple Watch is likely to stick around for a long time.